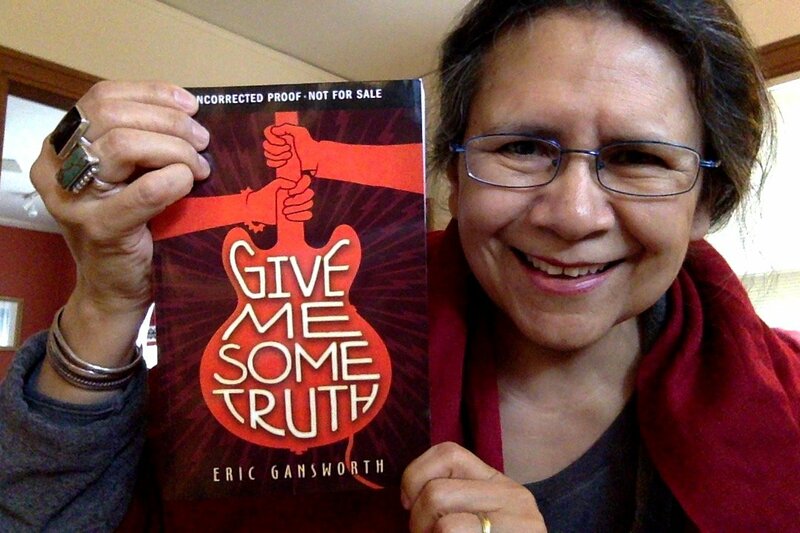 The title of Eric Gansworth's new book is Give Me Some Truth. As I read about Carson and Maggi, I marked one page after another. The truths in their lives made me laugh and made me cringe, too! There were moments when I thought "Don't do that, Maggi!" and others were I cheered for what she was doing. In chapter one, we're inside Carson's house on Memorial Day weekend, 1980. His brother, Derek, comes into Carson's room. He's got a bullet wound in his rear end. Carson helps him stop the bleeding. They're doing this as quietly as they can because they don't want their parents to know about it. In the description, you read that Derek got shot by the racist owner of a local restaurant. We learn about how that happened, later in the book. A passage in chapter one that I like a lot is when Carson tells us that Derek had "hit the jackpot in the Indian Genes roll of the dice" (p. 4). You wondering what that means? When Derek came into Carson's bedroom, Carson noticed he was not looking so good and tells him "You look kind of, um, pale." What Gansworth is getting at, there, is the range of what Native people can look like--even within the same family. Most people in the world think that we all have straight black hair, and dark skin, and high cheekbones... You know what I mean, right? If you don't, take a stroll down the aisle of the romance novels next time you're in the bookstore. Or, pull up a book seller website. Look for the ones about about Native men, you'll see what I mean. The fact: that image is a stereotype -- and it is something that Carson is dealing with. In chapter two, we meet Maggi! The book description tells us that she has just moved back to the reservation, but that happens at the end of the chapter. Chapter two opens with Maggi and her sister, Marie, who are sitting at a table at Niagara Falls, selling handmade Indian souvenirs they've made. We learn that Maggi likes to do beadwork that isn't traditional. And that she likes to sing and use a water drum. And that it is helpful to their sales if she'd sing and drum, because it attracted tourists. These two girls know how to play to the White guilt of the tourist crowd in other ways, too. I think what they do is hilarious! Packed in that chapter, though, are some of those truths I was talking about earlier. A certain kind of beadwork is much-loved on the reservation. Now--I imagine some of you read "beadwork" and thought about beaded headbands--but Maggi is thinking about things that tell readers that Native people today... are of this day. We wear baseball caps, but sometimes, those caps are beaded. And because I'm writing this post in the midst of graduation celebrations, I'm seeing a lot of friends and colleagues sharing photos of mortarboards that are beaded (do a search using beaded baseball cap, or beaded mortarboard and you'll see what I mean). We get another truth on page 17, as Maggi thinks about the permit they have to sell their work, and how it is "keeping the Porter Agreement alive, though the State Parks official vendors have tried for years to break the treaty)." That right there is definitely something that some Native readers will know about, and that the rest of us have to look up. It is history that isn't taught in textbooks--but that is known by those that it directly impacts. I'm really glad to see it and hope that people will look it up. Citizens of the US don't know much about Native history--but it matters a lot in ways they ought to know! Another part in chapter two that made me laugh was Maggi imagining a painting or beadwork she might do--in the conceptual style that Andy Warhol did... but she'd do "rows of Commodity Food cans, maybe ones we liked ("Peaches") and one we hated ("Meat"), with their basic pictures on the can in case you didn't know how to read" (p. 17). Native people who grew up during that time and got "commods" know exactly what those cans look like. As the chapter closes, Maggi's mom tells them they're moving back to the reservation, and we shift back to Carson. I might be back with more thoughts, but for now, I'll point you to Traci Sorell's interview of Gansworth, over at Cynsations. 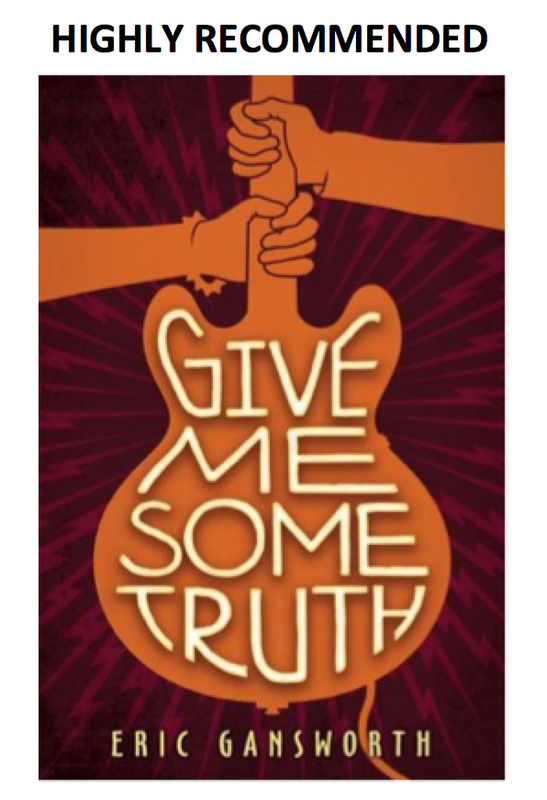 And I'll recommend that you get a copy of Give Me Some Truth. It comes out on May 29. I've read the ARC I got some weeks back, and have an e-book copy on order. And--if you're going to ALA in New Orleans, get a signed copy! Gansworth will be there. 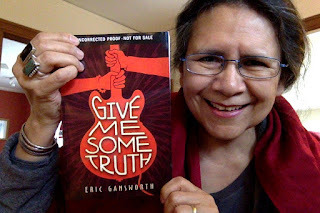 Published in 2018 by Arthur A. Levine (Scholastic), I am pleased as can be to say that I highly recommend Give Me Some Truth!